We’d love your help. Let us know what’s wrong with this preview of All the Above by Julia McDermott. To ask other readers questions about All the Above, please sign up. Between the first and last pages of this stirring true story lie the answers of how to walk with grace through one of life’s darkest traumas, be guided by a courage outside of yourself, and emerge whole. All the Above is as much the story of a husband and wife facing the reality that their nineteen-year-old son may die, as it is the story of his heroism knowing his death may be imminent. McDermott’s prose succeeds, as she weaves the details of a family’s intricate feelings as they walk through a Between the first and last pages of this stirring true story lie the answers of how to walk with grace through one of life’s darkest traumas, be guided by a courage outside of yourself, and emerge whole. All the Above is as much the story of a husband and wife facing the reality that their nineteen-year-old son may die, as it is the story of his heroism knowing his death may be imminent. McDermott’s prose succeeds, as she weaves the details of a family’s intricate feelings as they walk through a very private and emotional journey. The first inclination that something isn’t right is when Julia McDermott hears her son’s complaints during a telephone call. Nineteen-year-old Jack tells his mother that blurry vision is marring his attempts to study for his University of Georgia freshman final exams. McDermott tells her son that she will make an appointment with the family eye doctor for the week he arrives home after finals. She assures him that glasses will undoubtedly correct his vision problems. Biopsy results from the edema surgery show a cancerous brain tumor that must be removed. As Jack recovers, the family approaches the next surgery with research, and narrows the field of brain surgeons to three. Their decision is a joint one, with Jack taking the lead in the selection. They will go to the University of North Carolina where a renowned ophthalmic surgeon will remove Jack’s tumor. From cuddling with her husband in a motel room bed the night before Jack’s surgery, to the orange plastic seats in a gray-walled hospital waiting room, McDermott delivers. We are immersed in each intimate detail as she tells their story. If you’re a parent of a healthy child, this book will resonate with you long after you turn the last page. If you’re a parent of a child struggling with a serious illness, this book is a guiding light . No matter who you are, you won’t be disappointed as you root for this family whose spiritual and physical support of one another carried them through. All the Above is creative nonfiction at its best. It’s guaranteed. This memoir will keep you on the edge of your chair . . . or your pillow. Sleep will wait until you turn the final page. I really enjoyed reading this family's journey. Ms. McDermott shared some of her most vulnerable moments with us without shame. A very inspirational story for anyone, especially for someone who may be battling a health crisis. This is a very well written story of a family's journey through brain cancer. Having just gone through a serious medical issue with our son (though not as intense as Jack's brain cancer), the author's insights and emotions resonated with me and kept me engaged all the way. My wife even commented that she has never seen me read a book with such intensity! I found this book through a write up in the UNC alumni magazine. I was immediately drawn in by, of all things, the cover! (Potential spoiler ale This is a very well written story of a family's journey through brain cancer. Having just gone through a serious medical issue with our son (though not as intense as Jack's brain cancer), the author's insights and emotions resonated with me and kept me engaged all the way. My wife even commented that she has never seen me read a book with such intensity! This book shows what Amazon should be all about - really well-written, personal story with depth and insight. This family is so likable. Very engaging prose, and thankfully, as it is a true account, a happy outcome. Thanks to the author for sharing her work. An absolute privilege to read it. Best of luck. You felt like you were a part of their lives. You could tell how it touched everyone that was connected to this young man. How God had a different plan for him. What nice young man. Very touching story! ... while I appreciate the authors’s no-nonsense writing style, her tendency to describe everything — every person they encounter, every doctor, every room and chair they sit in, EVERYTHING — quickly became tiresome. I found myself skimming through page after page, looking for when the next interesting thing happened. I am, however, delighted that she shared this uplifting story in which others may discern God‘s grace. Julia McDermott is a multi-genre author of three novels and one work of creative nonfiction. Domestic psychological suspense DADDY'S GIRL was published in April 2016, and suspense UNDERWATER was published in Nov 2014 by Thomas & Mercer. French travel/New Adult romance MAKE THAT DEUX was released in Oct 2012. ALL THE ABOVE: MY SON'S BATTLE WITH BRAIN CANCER was published in March 2015, and was Julia McDermott is a multi-genre author of three novels and one work of creative nonfiction. Domestic psychological suspense DADDY'S GIRL was published in April 2016, and suspense UNDERWATER was published in Nov 2014 by Thomas & Mercer. French travel/New Adult romance MAKE THAT DEUX was released in Oct 2012. 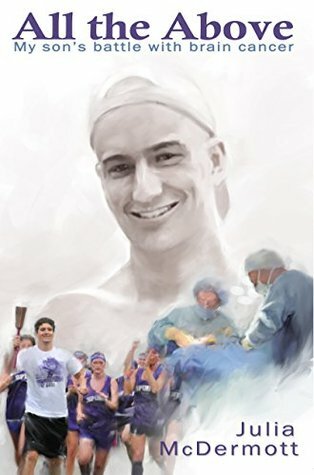 ALL THE ABOVE: MY SON'S BATTLE WITH BRAIN CANCER was published in March 2015, and was awarded Finalist - 2016 Georgia Author of the Year. DADDY'S GIRL was a Nominee for the 2017 GAYA, and UNDERWATER was a Nominee for the 2015 GAYA and the 2014 Killer Nashville Silver Falchion Award.